This is a recipe I’d like to tweak some more, but the ingredients are not terribly easy to come by. However, the flavor pairing I picked is one I really like. Did you know chestnuts are crazy expensive? I sure do now! I also had super ridiculous adventures trying to get some! It involved two trips, and two different health food stores and a grocery store. Also the discovery of a really cool candy store where I stocked up on jelly beans and old-timey candies! Once I procured a (very expensive) jar of (happily non-moldy) chestnuts, I was able to taste them and determine that they were, well, weird. Out of nowhere a couple days later I realized what they needed – maple! You know what also perked up this filling? MORE MAPLE. I experimentally boiled several of the pre-cooked chestnuts in maple syrup for a while and ended up with something that I’m so glad to have a little extra of: chestnut maple syrup, and is it ever awesome. Chestnut and maple go oh so well together. These cupcakes are almost perfect. Almost. Don’t get me wrong, they’re pretty great. The cake itself is sooo good. Especially hot out of the oven. You could just drizzle the maple syrup on that. I did. The filling is good, too. I’m just not crazy about the frosting. I don’t really like powdered sugar frostings, I guess. I much prefer buttercreams and meringues to cloudy icings. Also it was my first try at making a browned butter frosting, and I think maybe I didn’t brown it enough, or brown it correctly. Who knows. The chewy chestnut pieces on top are another issue for me. 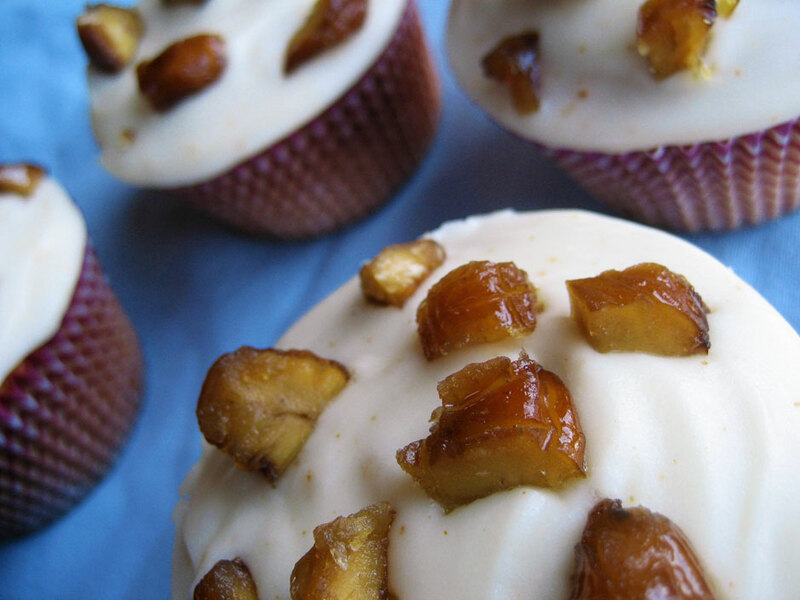 I like them and think they bring a little interesting extra texture contrast to the cupcakes, but are one of those things that make me self-conscious that maybe my stuff is a little too weird. Like they’d keep someone from wanting to try them. So if you are feeling extravagant enough to make these, you can skip that part if you’d like. I won’t be offended. But DO get some chestnuts to boil in the syrup. Really. Writing all of this has made me appreciate these cupcakes more, somehow. I was kind of mad at them earlier. I'm sorry, cupcakes. Place the chestnuts in a medium saucepan. Cover with maple syrup and cook on medium heat for about half an hour, stirring gently every once in a while. Don’t let it bubble too much or scorch. Using tongs, remove the chestnuts to a cooling rack over parchment or wax paper. Let the syrup cool a bit, then pour it into a clean jar (mine fit perfectly in an 8 oz. jar) and seal tightly. Allow the chestnuts to sit until no longer sticky (they will still be tacky but not overly so); overnight is fine. With a stand mixer on low, cream the butter until fluffy, then slowly add the sugar. Sift together the dry ingredients and alternately add wet and dry ingredients, minus the egg whites. If the batter is very thick and more like a dough, gradually add a bit more milk. Add the egg whites all at once and beat on medium until fluffy. Bake in an oven preheated to 350 for 15-20 minutes. In a small saucepan, bring the milk to a boil. Reduce to a simmer. Meanwhile, combine the yolks, egg, syrup and cornstarch and whisk until smooth. Slowly add the hot milk in one continuous stream, whisking constantly. Return to the saucepan and simmer until thickened, whisking constantly. Once it’s thick, immediately strain it into a bowl and add the butter, stirring constantly. Place in an ice water bath to finish cooling if you’ll be assembling the cupcakes immediately. If you’re assembling the cupcakes in a few hours, cover the bowl with plastic wrap pressed down onto the surface. Cut a few holes to vent and refrigerate. Melt the butter in a small saucepan over medium heat. Continue to cook until golden brown. Add the browned butter to the sugar and whisk in the milk and maple spread/syrup. Continue whisking until smooth. 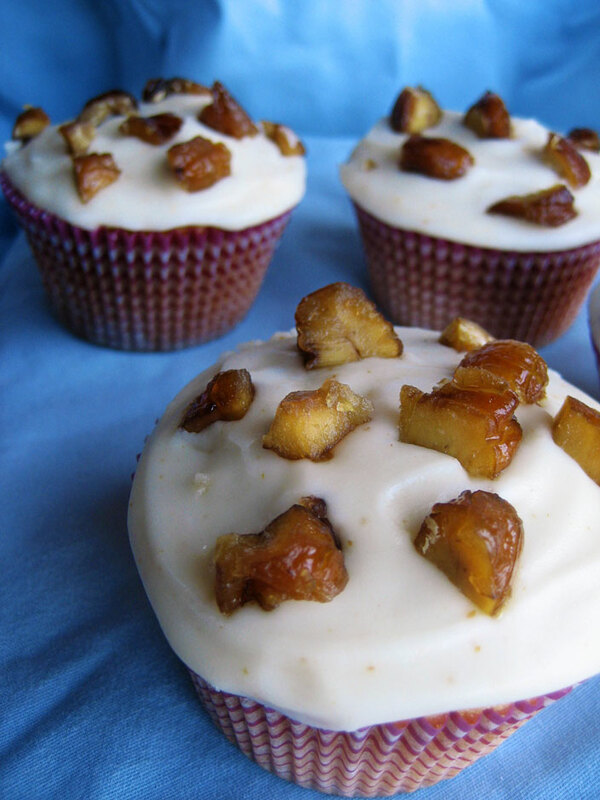 Fill the cupcakes with the maple cream using the cone method. For each one, trim the cone from the top so it’s flat on both sides and set aside briefly (this is so you can get the most filling in the cupcake without it oozing everywhere). Add a few drops of maple syrup onto the cream filling, then replace the tops. 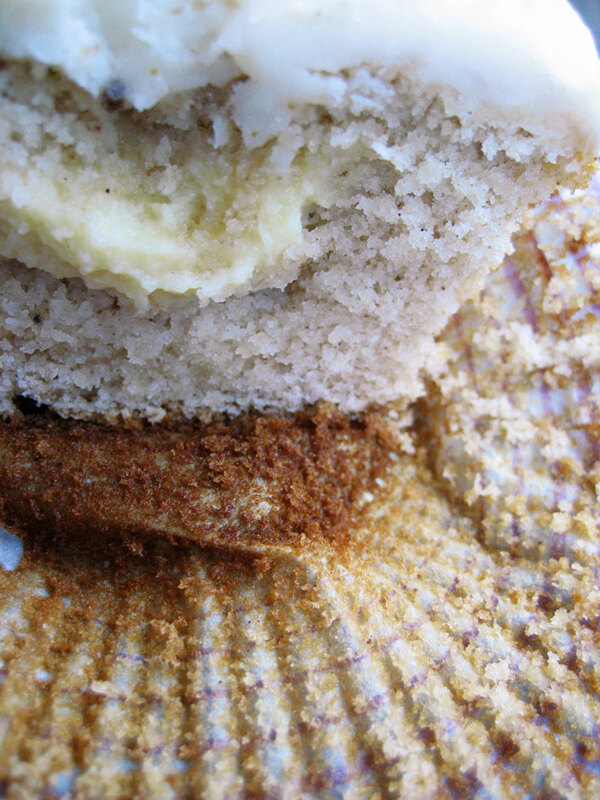 Frost each cupcake with a butter knife and press chestnut bits into the frosting, shiny side up. Chestnut and maple maybe isn’t the first thing you think of eating when you’re trying to coax out spring via foodstuffs. But it’s a combination that I’ll use again. I’m totally using the rest of the chestnut flour for muffins – it’s really wholesome-tasting and naturally sweet. A Bunnycake Easter Plushie by DOGBONEART, http://www.etsy.com/view_listing.php?listing_id=21636297. A whimsical piece by CAKEASAURUS, http://www.etsy.com/shop.php?user_id=5729584. PLUS, IronCupcake:Earth can not forget our good friend, CAKESPY, http://www.etsy.com/shop.php?user_id=5243382, who is now going to be doing a piece for our winner each month until further notice – sweet! Last and certainly not least, don’t forget our corporate prize providers: HEAD CHEFS by FIESTA PRODUCTS, http://www.fiestaproducts.com, HELLO CUPCAKE by Karen Tack and Alan Richardson, http://blog.hellocupcakebook.com, JESSIE STEELE APRONS http://www.jessiesteele.com; TASTE OF HOME books, http://www.tasteofhome.com; a t-shirt from UPWITHCUPCAKES.COM http://www.upwithcupcakes.com/. Iron Cupcake:Earth is sponsored in part by 1-800-Flowers, http://www.1800flowers.com . And as a special thank you, we would like to once again thank DIANAEVANS – http://www.etsy.com/shop.php?user_id=5599270 for her participation in the February challenge. An incorrect link was posted and we want to be sure that she gets the recognition she deserves. Thanks again Diana! They do look gorgeous although I can understand being mad at an item if it’s caused you a lot of trouble! 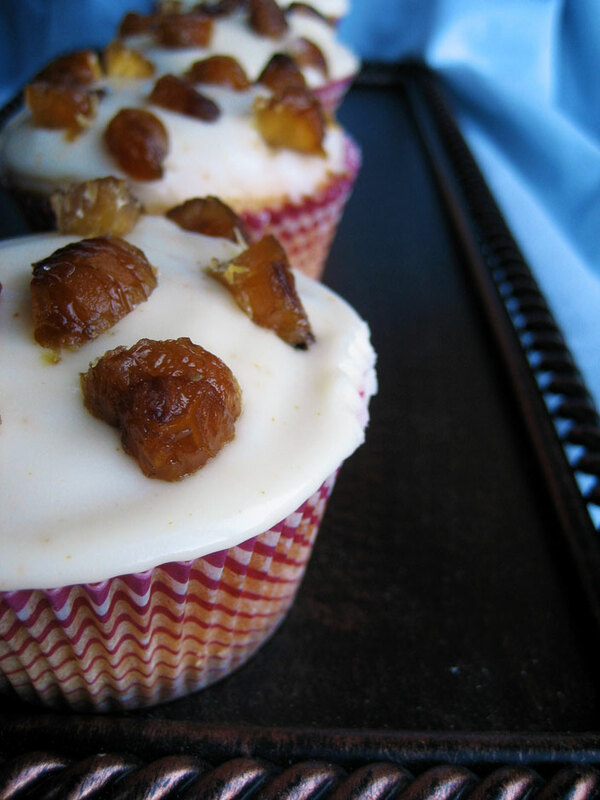 So interesting.. Never quite had chestnuts on cupcakes before. Mmm I love chestnuts and I have a bag of frozen ones in the freezer that I can’t figure out what to do with…hmmm (wheels turning) – cupcakes? ?